Reliable electricity is a rare commodity in some parts of Guinea, which means some traditional medical equipment often is useless. 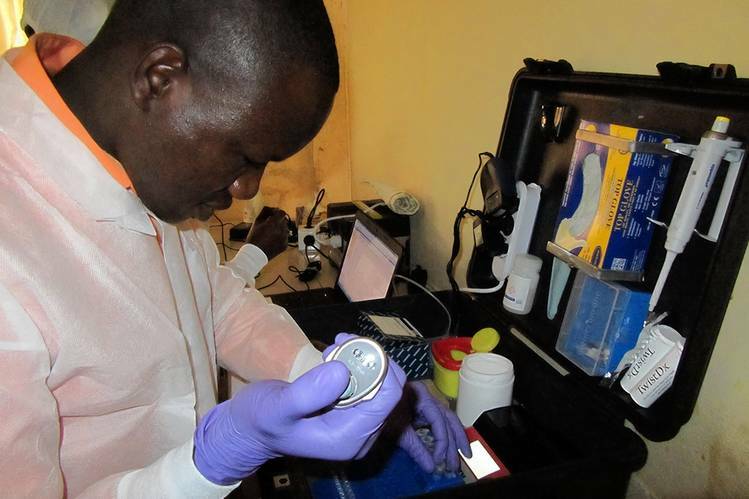 So researchers there are using a new tool to identify Ebola cases: a portable diagnostic machine that fits in a suitcase and runs on a solar battery. The suitcase technology is part of a growing push among scientists and startups to develop simplified, low-cost diagnostics for use in the field, particularly in remote or low-income regions that lack electricity or sophisticated lab equipment. Other examples include smaller, simplified versions of the polymerase chain reaction, or PCR, machines that most Western labs use to look for traces of pathogens’ DNA, and diagnostic test tubes that can be activated with body heat. The technology aims to facilitate on-the-spot diagnosis of infectious disease, water contamination or other problems through DNA detection, without the need to ship samples days or weeks away to big-city labs. While much of the technology is aimed at improving health care in the developing world, researchers say it should also prove useful for schools and other cash-poor institutions where the science of genetics is being studied.